JBWW and the Card that Had to be Made! Sometimes a card just HAS to be made! This was the predicament I found myself in yesterday – do I make it or do I not? Jeanne sent me her idea for the JBWW Challenge this week – use a sentiment that is not a stamp, one that is either handwritten or computer generated. She opened the door me, and I really couldn’t help myself. The card had to be made! I’ve had this idea running in my twisted, warped mind ever since I saw the Way to Go set by Gina K. Designs. I even told Kim of My Favorite Things about my idea and she kind of laughed – then said “that’s funny.” So in my attempt to be fair for all the Design Teams I’m on, I even threw in some Lizzie Anne Designs. It really is not my stamping choice to mix companies like this, BUT this card HAD to be made. The sets demand it, there is no other choice, and my mind could not let it go. 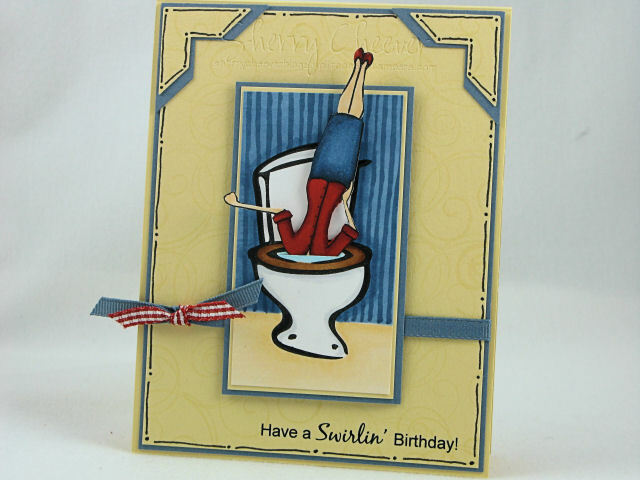 I give you my sample for the JBWW Challenge – A Swirlin’ Birthday! I stamped the toilet bowl from Way to Go by Gina K. Designs and the teacher from Back to School by My Favorite Things, and colored them with Copic markers. After layering the toilet bowl image, I cut a small slit in the middle of the seat, and stuck the teacher through to the back. There is a small piece of mounting tape on the back of her skirt, to hold her in place and to add a little dimension. For the background, I printed out my sentiment on a piece of Barely Banana cardstock, cut it to size, and then stamped in Versamark, one of the swirl images from So Swirly by Lizzie Anne Designs. Get it – swirl, so swirly, swirlin’ – BWAHAHAHAHAHAHAHA, oh I slay myself! I added the photo corners, some black doodles and a little bit of ribbon to finish off the card. Now for the JBWW Challenge. As I stated earlier, before I got so carried away with my card, the challenge today is to to make your own phrase using the computer or writing it out yourself. Any image, any theme, just get creative with your phrases and have fun!!! If you upload to your SCS Gallery, please use the keyword JBWW. Please post a link to either your gallery or your blog here on my blog, or on Jeanne’s. Can’t wait to see what you create today! Good morning! I’m getting ready to head out to the airport, it’s time to head home. I have had such a marvelous time with Jeanne and looked forward to visiting with her again. Think road trip! Before I call it a day on the computer, I have another Sneak Peek of one of the new sets from My Favorite Things. This set is called By the Seashore, but I had to give it my own little twist. She’s walking along a dirt path instead of the ocean. The image was colored with Copic Markers and then raised with mounting tape on the background panel. Both the background panel and the main image panel were sewn on the sewing machine. I had gone through Jeanne’s stash of paper, and found this adorable Memory Box paper and couldn’t resist cutting into it. I loved it so much that I had to purchase some right away. Jeanne is a bad influence – hehe! Anyhoo, I stamped one of the sentiments from the set on the bottom panel and added a little ribbon. Too much fun! I’ll be back home in Indiana late tonight – so until tomorrow when I have some more fun images from Gina K. to share with you! I’m wrapping up my final day in Texas. Jeanne and I have decided to have one of those no running, loll around days. We’ve been on the run for three solid weeks now and I have to tell y’all that I’m one tired little puppy! I have so enjoyed my visit with Jeanne, both in Louisville and in Texas and as long as she’ll let me come back, I’m here. I have been able to get together with so many friends and each and every one of them has made this trip so special. As Jenn would say, Good Times! Enough of my sentimental sappy ramblings, let’s get to some stamping before I cry. My Favorite Things is releasing 3 new sets on November 1st, and I have one to show you today. This set is called Build a Bouquet, but I stamped out a card with a little twist. Actually, I have been calling this my fuzzy ball tree since I first started working on it. If you want to get technical about it, I suppose it is actually a Christmas Topiary, but I so love saying fuzzy ball tree. There are 4 different sizes of circles in the set but I worked with only 3 of them. I stamped the circles in VersaMagic Chalk Inks and then over stamped with a smaller flower in the set using different colors of green. The tree trunk is made with one of the flower stems from the set and the pot is just that, a flower pot. To finish the image off, I added little dots of Red Stickles. The background paper is BasicGrey Dasher that I found at Jacksonbelle Embellishments. Think Pink Auction for the Cure! The Design Team for My Favorite Things got together and decided to raise more money for cancer initiatives. Each designer made one card using Think Pink for a set of cards that are being auctioned on eBay. The set consists of 18 cards with envelopes, and 100% of the proceeds will be donated to Susan G. Komen for the Cure. Photos of the complete set can be found here, and the auction ends on October 22, 2007. This is my card for the auction. 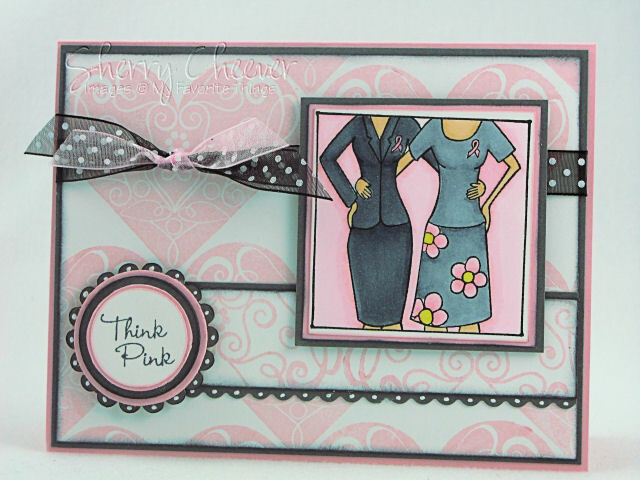 The card combines both the Boho Blossoms and Think Pink sets. The main image was colored with Copic Markers and the hearts were stamped with VersaMagic Chalk ink. The sentiment is made by punching circles of light weight coasters and mounting them together. I can hardly believe it’s Wednesday already. My first house guest is due in tonight, and I still need to clean. Of course, I could ask them to leave their signatures in the dust – but honestly I’d be a little embarrassed! There are a few things on mind this morning. First, I had a birthday on Monday. My mother is getting older! I received so many cards in the mail and I want to take this opportunity to make a public THANK YOU! 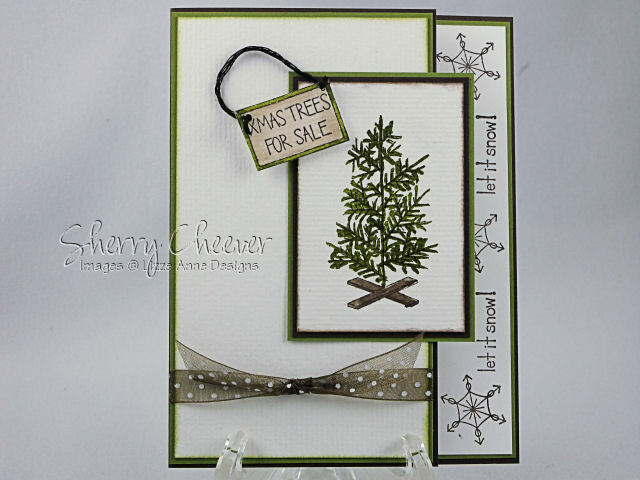 I will be sending private messages as well, and I will be showcasing these beautiful cards here on my blog. But first, I have got to pick up and clean this house! I hope you all understand! Second, my mother is getting older! Yep she is. Well at least that is what I tell her every time I have a birthday! My youngest daughter was born one week after my 30th birthday. I was sick on that birthday and was at home. We had run to the hospital countless times. Finally one week later she arrived – a few weeks early but she got here. Anyhoo, when I forget how old I am, she very politely reminds me – *Mom, I’m 19 so you have to be 49! * She never lets me forget! 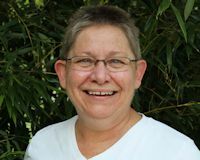 As I start that slide into the big 5 – 0, I remind myself that it is just a number. And it is just a number! I feel young at heart, but I do find that with every five years, my body takes on a different stage. I tire more easily and I have a few more aches and pains, but I look forward to what is coming my way! When I turned 40, my life took a fabulous turn and I had more fun that I had ever had. Now that I am nearing 50 I can’t wait to see what is around the corner. It can only get better!!!!! I live every day to its fullest, and now do what I want to do. I’ve learned to say *no*, and *that really isn’t my problem*! I’m settling into who I am — what a marvelous feeling it is. One of my favorite mottos is LIVE OUT LOUD – and I will continue to do so each and every day! So enough of my babblings about getting older (or should I say getting better). Let’s talking stamping. Even though I have two house guests arriving in the next two days, and I so need to clean, do laundry, etc., I had to do today’s Sketch Challenge on Splitcoast. If I didn’t, Roxie would come after me and quite frankly, that is not something I want! So here’s the card I put everything aside to do this morning. I stamped the little tree from the Lizzie Anne Designs’ set, Christmas in the City, on watercolor paper and then water colored with reinkers, my old watercolor brush and a cup of water. My favorite way to watercolor – for the life of me I cannot get used to a blender pen or aqua painter. So I’ve quit trying! I know brown and green are not typical Christmas colors, but to me it just made sense today. 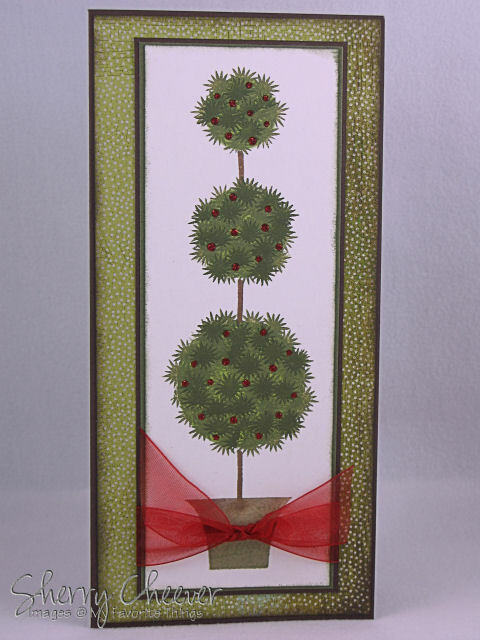 I used a piece of watercolor paper for the background panel on the front of the card (I liked the texture), and just tied a ribbon around the bottom. The sign is raised on mounting tape and I’ve sponged all the edges in coordinating colors. The inside of the card is made with SU Whisper White. 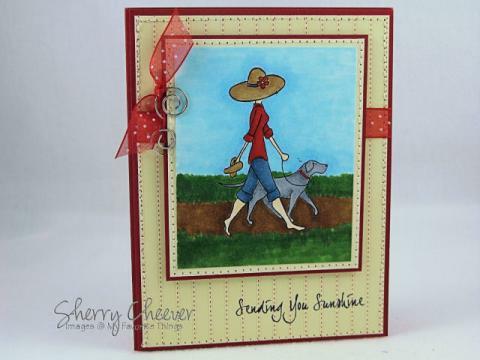 This is such a fun sketch and I know when I have more time, I will be making another card!